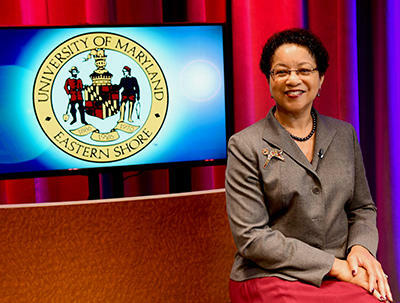 Dr. Heidi M. Anderson, 16th President of the University of Maryland Eastern Shore. Student members of UMES’ NAACP chapter staged a peaceful rally Tuesday night to demonstrate solidarity with peers troubled by the Aug. 9 shooting death of Ferguson, Mo. teenager Michael Brown. PRINCESS ANNE, Md. –– Dr. D. Jason DeSousa is the University of Maryland Eastern Shore’s next Vice President for Student Affairs and Enrollment Management. DeSousa’s first day at UMES will be April 20. He currently works at Fayetteville (N.C.) State University, where he has been assistant vice chancellor for student retention since January 2012. PRINCESS ANNE, Md. –– Dr. Arthur L. Allen, a pioneer in the pursuit of ways to help agriculture on Delmarva be more environmentally compatible with the Chesapeake Bay and its tributaries, is a 2012 recipient of the University System of Maryland Board of Regents’ Faculty Award for Research/Scholarship/Creative Activity.